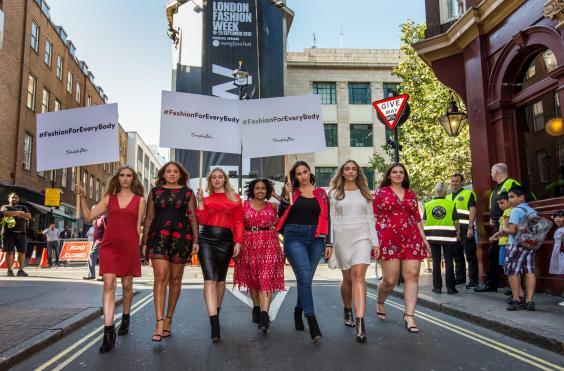 Yesterday models stopped traffic outside the home of London Fashion Week in protest against the runways obsession with size zero. Seven models stood outside the venue on Brewer Street, Soho, ahead of the start of LFW tomorrow in a bid to call for models of all shapes, colour and sizes to be featured on the catwalk. Ed Watson, Creative Director at Simply Be, who ran yesterday's protest, said, "while there's nothing wrong with being 6ft tall and naturally thin, it's not representative." "It's not about thin-shaming. But, what we want is more diversity on the catwalk." The models in protest ranged from sizes up to 22 and included one of the UK's leading disabled models, Kelly Knox. She said, "We are trying to make it compulsory to make samples of 8 and 12, and then they'll (the industry) use bigger models." The fashion industry's argument is the cost, but can you put a cost on people's health. Research carried out by Simply Be, found that more than three quarters of people questioned think size zero models should be banned from catwalks because they promote an unhealthy body image. "Fashion is supposed to be about expressing your individuality, so why should all models fit one mould?" Where do trends come from? Spanx... Do they really work?